The film explores the unexplained death of Gordon Dunn (Martin Donovan), a visionary scientific pioneer whose body is found shortly after the unveiling of his newest work: a device able to extract, record and play a person’s memories. Gordon’s wife, Carolyn (Julia Ormond – Mad Men, The Curious Case of Benjamin Button, Legends of the Fall ), retreats into her house and cuts off contact with the outside world when a mysterious man (Peter Dinklage – Game of Thrones, X - Men: Days of Future Past, The Station Agent ) shows up. After stealing the machine, he uses it to try and solve the mystery, beginning an investigation of memories that lead him to unexpected and dangerous places. 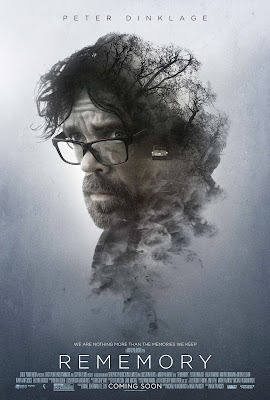 REMEMORY was written by Michael Vukadinovich and Mark Palansky and produced by Daniel Bekerman and Lee Clay. Directed by Palansky ( Penelope , Netflix’s A Series of Unfortunate Events ), REMEMORY folds science, superstition and the supernatural into a place where one man finds terror – and the truth. The film will be released by Google Play on August 24th, 2017 and will be in theaters and on demand by Lionsgate Premiere on September 8th, 2017.